With trap endorsement, may fish 10 traps per household. 15 lobsters per day. 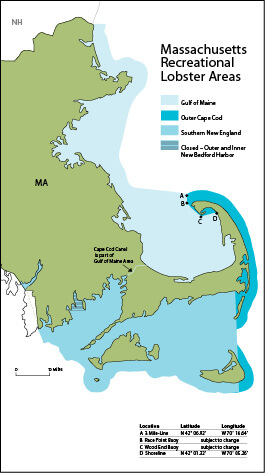 Lobsters may be stored and retrieved in excess of this limit, provided fishing activity is not occurring. No trap fishing ½ hour after sunset to ½ hour before sunrise. It is unlawful to possess or land any lobster that is egg bearing, from which eggs have been forcibly removed, or that has come in contact with any substance capable of removing eggs. It is unlawful to possess or land any female lobster that bears a v-shaped notch or indentation on the base of the tail flipper to the right of the center flipper that is 1⁄8″ or deeper with or without setal hairs. It is unlawful to possess or land any lobster taken by spear gun, pole spear, or other device that pierces the shell as means of harvest; by dipping or dipnet; by star trap or any trap that is fished in an open configuration until retrieved; by dragging or the use of any hauled nets or dredges; or snaring and poles with loops. No tending or hauling traps ½ hour after sunset to ½ hour before sunrise. Use of non-trap gears is allowed at night. 50 edible crabs combined and not to exceed 25 blue crabs.